HTC to take on Spotify with music streaming service? HTC could be about to enter the music streaming fray at MWC 2012 with a branded Spotify-competitor created as part of its partnership with Beats Audio. 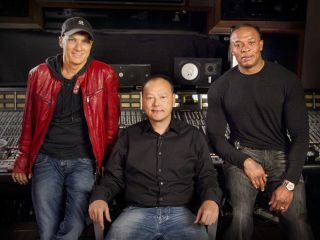 Rumour has it that HTC is working closely with music industry mogul and Beats' head honcho Jimmy Iovine to create the streaming service after talks with existing companies, including Spotify, failed to go anywhere. The as-yet unconfirmed music service would come as the default player on HTC phones and tablets. GigaOm's source couldn't provide any pricing details so we don't yet know if the service would be bundled with devices or if you'll have to cough up a monthly fee to use it. But why would HTC, a handset manufacturer, bother sticking its oar into the previously unrelated music streaming market? Same reason it gave movie rental a whirl in the not-massively-successful-thus-far HTC Watch: differentiation. All the phone manufacturers work within the parameters of the OSes their products run, so any move they can make to differentiate their products from the milieu and create some kind of user loyalty is going to be worth a punt. Particularly as the bloom seems to have come off the HTC rose in recent months, with the company's meteoric rise to top Android maker tempered by falling sales and dipping profits.